The AUR is just what it's name tells you it is: it's a reference manual for the HP48 G Series. It has the same outside appearance as the HP48 G Series User Guide (the manual you get with your HP48 G or HP48 GX when you buy it), except that it's much thicker (just under 4 cm). 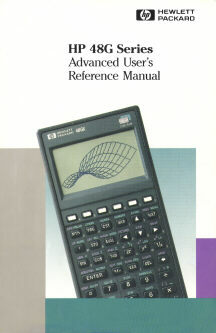 The AUR contains about 650 pages of useful information about your calculator. What information does the AUR contain? The AUR contains information about UserRPL programming, quite a lot of programming examples, a complete command reference for all the (UserRPL) commands the G Series knows and reference lists about all equations, most error and status messages, all units, etc... Of course it has an extensive index at the back of the book. Contains: Understanding Programming, Entering and Executing Programs, Viewing and Editing Programs, Creating Programs on a Computer, Using Local Variables, Using Tests and Conditional Structures, Using Loop Structures, Using Flags, Using Subroutines, Single-Stepping through a Program, Trapping Errors, Input, Stopping a Program for Keystroke Input, Output, Using Menus with Programs, Turning Off the HP48 from a Program. Contains: Fibonacci Numbers, Displaying a Binary Integer, Median of Statistics Data, Expanding and Collecting Completely, Minimum and Maximum Array Elements, Applying a Program to an Array, Converting Between Number Bases, Verifying Program Arguments, Converting Procedures from Algebraic to RPN, Bessel Functions, Animation of Successive Taylor's Polynomials, Programmatic Use of Statistics and Plotting, Trace Mode, Inverse-Function Solver, Animating a Graphical Image. A description of what the command does (with stack diagrams). Ways in which you can access it from the keyboard (which submenu you need, or if you can only type it in in Alpha-mode). Which flags the command is affected by. Remarks, and a list of related commands. Often a command has one or more example programs too. This chapter is the bulk of the whole book; it's 424 pages thick. This chapter contains one entry for every section in the built in Equation Library (EQLIB). Each entry contains: a table of used variables and then for every set of equations an entry with some more info about the equation set, the picture that goes with it (if any), all the equations and one or more sets of example numbers and solutions. The end of the chapter has a list of references from which all the equations were taken. This chapter contains two tables with all possible messages (well, most of them). The first has them sorted alphabetically and shows the message, the meaning and the ERRN number in hex. The second has them sorted on ERRN number (and thus on category) and only contains the number in hex and the message itself. This chapter contains a table with all units the HP48 G Series knows. It contains the unit (both the name you use on the calculator as well as the full name) and the value it represents in SI units. This chapter contains a table with all the system flags of the HP48 G Series. The table contains the number followed by a description of its use and the results you get when the flag is set or clear. This chapter contains a table with all the reserved variables of the HP48 G Series (ALRMDAT, CST, "der"-names, EQ, EXPR, IOPAR, MHpar, Mpar, n1/n2/..., Nmines, PPAR, PRTPAR, s1/s2/..., VPAR, ZPAR, SigmaDAT and SigmaPAR) with complete information about what they are used for and about all possible parameters that can be put into them. This chapter lists all the commands that are new to the HP48 G Series, with a brief description of what the commands do. A list like this can be found elsewhere in the HP48 FAQ list as well. Contains: Object sizes, Mathematical simplification rules used by the HP48, Symbolic differentiation patterns used by the HP48, the EquationWriter's expansion rules, References used as sources for constants and equations in the HP48 (other than those in the Equation Library). This chapter contains info on parallel processing that makes UserRPL look even more like a real functional programming language by letting (almost) all the commands function on lists of parameters as well. (For those of you who know other functional programming languages: this gives all the internal commands built-in map capabilities). Do I need the AUR? Yes, you do. In my humble opinion the AUR is just "The Manual, Part II" and every serious owner/user of a HP48 G or HP48 GX should have it, especially if you are (going to be) programming in UserRPL for any reason. A lot of the frequently asked questions that pop up on comp.sys.hp48 are simply questions that are meant to be answered by the AUR. Why didn't HP supply the AUR with every HP48? Where can I get the AUR? You should be able to buy (or order) it from the same shop where you purchased your calculator. The HP part number is 00048- 90136. The book does not seem to have an ISBN number; it's a HP part, not a book. Does the AUR contain any SYSEVALs or LIBEVALs? Yes, it contains exactly one. The example for the SYSEVAL command tells you that #30794h SYSEVAL gives you the version of your HP48. My HP48 GX rev. P gives "HPHP48-P". Does the AUR say anything about SysRPL or ML?